This is a filling for the piecrust. 1. In a saucepan, mix cornstarch with 2 tbsp cold water until blended. Stir in half of blueberries and sugar; heat to boiling over medium-high heat, pressing blueberries. Boil 1 minute, stirring constantly. Remove saucepan from heat; stir in remaining blueberries. 2. 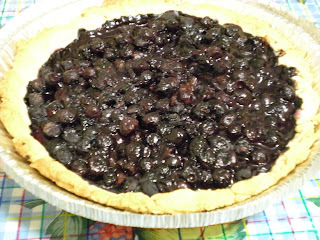 Pour blueberry mixture into baked piecrust. 3. Cover with plastic wrap and refrigerate at least 5 hours.